Dunkin’ Donuts Mobile Cards can be sent via email, text or Facebook through the mGift feature on the Dunkin’ Donuts mobile app, available for both iPhone and Android smartphones. With the mGift feature, users can send a variety of virtual Dunkin' Donuts cards, which can be redeemed directly from a mobile phone at more than 6,000 participating U.S. Dunkin' Donuts locations. All Dunkin' Donuts mGifts can also be added directly to the Dunkin' App, reloaded right from the phone, and used as a fast, convenient way to pay. Throughout the week, Dunkin’ Donuts will also be sharing the love with fans across Facebook, Twitter, Instagram and Pinterest with a series of fun and colorful content inspired by Valentine’s Day. Dunkin’ Donuts has created a special “DD Love” Pinterest board, offering fans inspiration on the small ways they can surprise and delight the special people in their lives leading up to Valentine’s Day. Fans of Dunkin’ Donuts on Instagram and Pinterest are also encouraged to share photos of how they’re spreading the love, using the hashtag #DDLove. Dunkin’ Donuts’ Twitter followers are also in for a “sweet heart” of a sweepstakes starting on Wednesday, February 13, which will be announced by @DunkinDonuts. In addition to making a great gift, coffee may actually play a part in helping to brew romance. According to an independent survey of more than 1,000 Americans, commissioned by Dunkin’ Donuts and conducted by GfK, the majority of people (52%) said they think that going out for coffee with their sweetheart can be just as romantic as going out for dinner. The survey also shows that the choice for the most romantic flavor of coffee is French Vanilla, followed by Hazelnut. 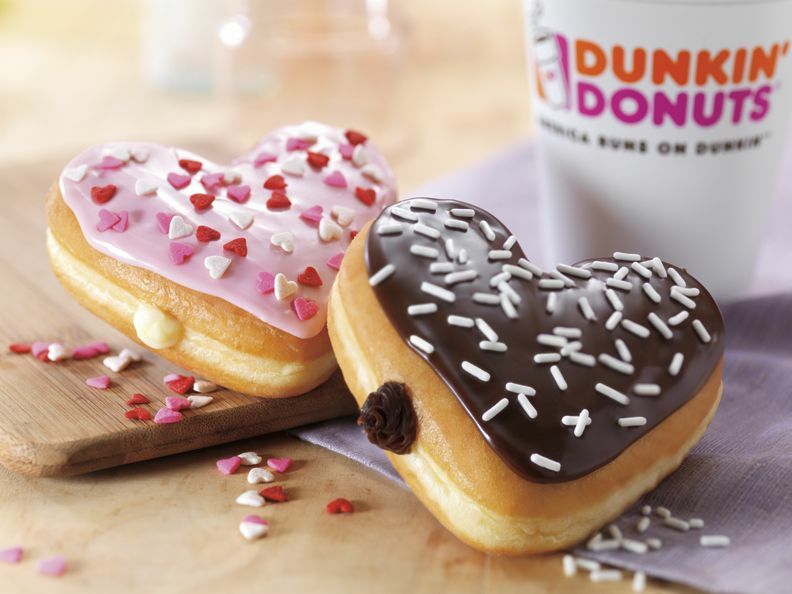 This Valentine’s Day season, heart-shaped donuts have also returned to Dunkin’ Donuts. The Brownie Batter Donut, a heart-shaped donut filled with chocolaty brownie batter filling, topped with chocolate icing and white sprinkles, and the Cupid’s Choice Donut, a heart-shaped donut filled with Bavarian Kreme, topped with strawberry flavored icing and a festive mix of pink, white and red heart-shaped sprinkles, are available at participating Dunkin’ Donuts restaurants nationwide through the end of February. Finally, Dunkin’ Donuts has a new lineup of Dark Chocolate Mocha beverages to keep chocolate lovers running on-the-go, any time of day, including Dark Chocolate Mocha Coffee, Dark Chocolate Mocha Latte, Dark Chocolate Mocha Frozen Coffee Coolatta® and Dark Hot Chocolate, available for a limited time at participating Dunkin’ Donuts restaurants. The survey results contained in this report are from GfK Roper’s weekly telephone omnibus service, OmniTel. This survey was included in an enhanced Super Omnitel wave, which employs a dual frame sampling approach of 753 landline telephone and 253 cell phone interviews, thus ensuring a more representative sample of the population, Interviewing was conducted from February 1 – February 4, 2013. A total of 1006 interviews with adults aged 18+ were completed. The margin of error for this study is +/- 3 percentage points.